Fly Creek Inlet is located on the east side of Mobile Bay almost directly across the water from the Dog River, which is about 10 miles to the northwest. The city of Mobile is 13 miles to the north-northwest. 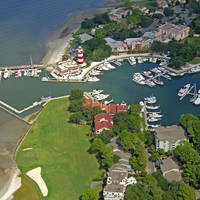 Depths on the approach to the creek are between six and eight feet, and dockside depths at the local marinas are from four to six feet. Inside the creek is Fly Creek Marina, which has transient slips available for visiting guests, shore power, ice, marine supplies, restrooms/showers and a grocery and other provisioning opportunities available within walking distance. There is unfortunately no fuel available here. 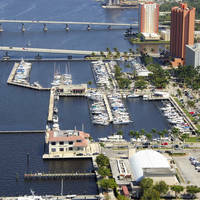 Eastern Shore Marine is located on the premises with a 35-ton lift and associated repair services. The town of Fairhope is located just to the south and has a variety of other shoreside services as well. Fly Creek is reached via an approach from the west through Mobile Bay. From Mobile Bay, set up to intercept the area around waypoint 30 32.706N 87 55.275W. Once you have arrived in the area of the waypoint, set a course to the east on a heading of 111 degrees magnetic for about 1.4 miles to pick up flashing red 2, which is about a half-mile off the entrance to the creek. From flashing red 2, head in toward the mouth of the entrance, making sure to follow the other placed aids to navigation along the channels edge (some visible in the image above). 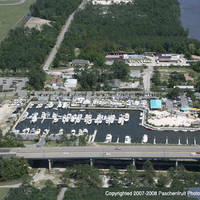 The Fly Creek Marina dominates the landscape inside once you have arrived, and the Eastern Shore Marine facility is located on the far side of the creek in the large white building. No reviews yet! Be the first to write a review of Fly Creek Inlet.